Late in the summer of 2009 my friend Dave and I went on a road trip to Southern California. One of the highlights of the trip was traveling out to the Salton Sea to check out the rundown buildings and remnants left from the tourist boom that fizzled out in the late '70s and '80s because of the ecological state of the sea itself. 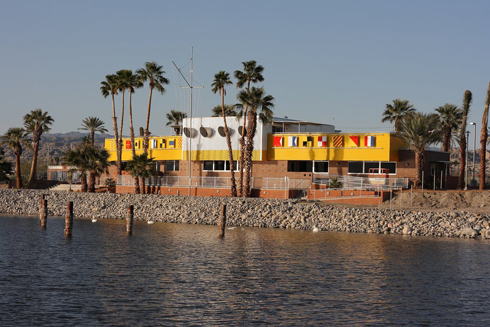 The North Short Yacht Club was once a million dollar resort facility that saw celebrities and tourists using the marina. Throughout the 1960's this place saw a lot of traffic, but as the salt levels in the water continued to rise the desirability of the location weakened. After several floods in the decades that followed, the marina was eventually unusable and the yacht club was finally closed. Dave and I visited in August 2009 when renovations were just beginning - everything was still in a rough state and the yacht club was still very much abandoned. Today, however, the yacht club looks much like it did back in the 1960's (see the picture of the renovated facility below). Supposedly there's now a museum and community centre inside. Recently renovated North Shore Yacht Club. I wanted to post this because it has quickly dated the footage that I shot just last year. Check out my Salton Sea videos to see what the rundown building looked like for over a decade - sitting empty on the shore of the Salton Sea in California. For more on our experience and the entire road trip (labeled Indio Outio), you can read my full post about visiting North Shore here. The north shore yacht club is really good looking and worthy to be there.